It’s all about what grows best where. Australian plants are more popular now than ever before. However in many retail nurseries, there seems to be more knowledge available about exotic plants rather than Australian plants. In the past many Australian plants were often sold with poor knowledge of their growing conditions and wrong advice, such as they don’t need pruning, fertilizing etc and consequently there were many disappointed gardeners with poorly grown scrappy ugly plants. With the resurgence in interest in Australian plants comes the question about how difficult are they to grow. Because of the incredible diversity and range of our climate zones and consequently plants, you cannot generalize, so we have to group the plants according to dominant climate zones. 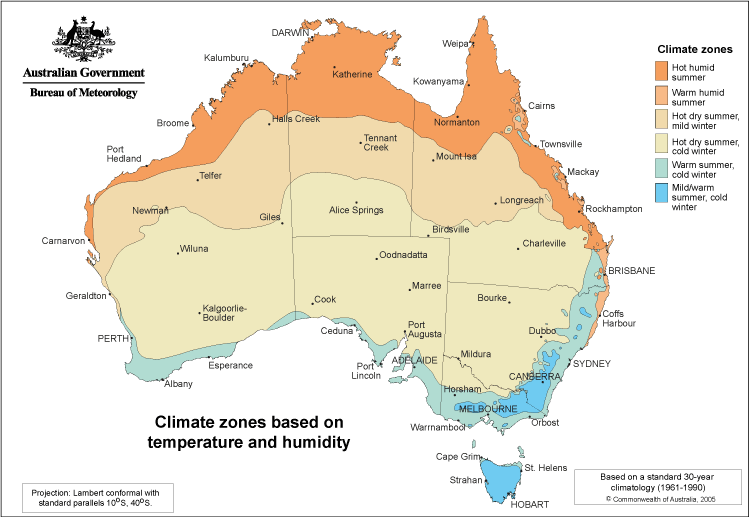 Of the different methods of classifying the climate of Australia, the temperature and humidity zones map above is probably the most useful for our purposes. This map identifies six key zones across Australia, based on a set of definitions relating to summer and winter conditions as shown in the key. Hot humid summer (average max > 30°C). Warm winter. The primary area extends across the north of Australia from Carnarvon through Port Hedland, Broome, Darwin and Cairns, and south to Bundaberg.. Warm humid summer (average max < 30°C, min > 10°C, frosts are rare). Mild dry winter. Includes the eastern seaboard from Brisbane south through Coffs Harbour to Sydney. Also includes coastal WA from approximately Geraldton to Carnarvon. It is a mild climate, with low winter rainfall and reliable summer rainfall. Hot dry summer cool winters most of Central Australia (average max < 35deg C but over 50 deg C possible min >5 deg C with rare frosts to -7. 5 deg C) ~250mm of unreliable rain pa Defined seasons. Warm summer, cool winter (average max < 30°C, min > 5°C, with some light frosts). Includes inland Qld, some NSW tableland areas and the coastal region south of Sydney. These zones experience the distinct four seasons. The ocean moderates temperature in coastal areas overlapping this zone with subtropical ones. The rainfall is reliable year round. This zone shares many of the features of the Warm Temperate zone. It includes much of southern coastal Australia from Melbourne, Adelaide through to Perth. Rainfall is predominantly in winter with a low summer rainfall. The summer is warm but with a low humidity. Mild or warm summer, cold winter (average annual min 0°C to -5°C, with heavy frosts). Includes high areas of the NSW Northern Tablelands, Southern Tablelands, Canberra/ACT, VIC and most of Tasmania. Spring is a pivotal event and the summer growing season is short. Alpine areas may experience snow. These zones contains amazing plant diversity (especially SW Western Australia). The mild climate allows the greatest number of opportunities to grow plants from all over Australia, and most of the horticultural plants in these regions are easily grown. However if you attempt to grow some of the great plants from the arid interior region outside the Mediteranean zone, humidity/excess moisture can be a threat to success. Some of Australia’s most spectacular Grevilleas, Hakeas, Eremophilas, Ptilotus plus many other ephemerals and paper daisy type plants etc come from this region. Some of these will grow well in temperate regions, especially in the more Mediterranean temperate areas. Grafting can help with some, but others are too specialized to thrive and look their best. A lot of alpine, mountain and Tasmania’s wonderful flora will not thrive in temperate mainland regions. Many of the really beautiful plants in these places are specialized to their micro climates, and unless you can successfully replicate these there will be problems. However as always, there are exceptions – Scleranthus biflorus is one popular example. The lessons here are that many plants that thrive on low humidity, can suffer badly on the east coast. This impacts on the number of arid land Western and central Australian plants that can be grown on the warm humid east coast. There are less problems with these plants if you live in a more Temperate Mediterranean climate region. There are plants from the extreme tropical and cold regions that are remarkably versatile and adapt well to other climates. Because of there are huge numbers of easy to grow Australian plants, retail nurseries are full of them. While many of these are great flowering plants radically different to exotic plants, there are also a good number that have become ‘popular’ that are very useful but relatively unspectacular. Even though they are right out of their comfort zone, many of these plants will grow in the east states but may not thrive or ever look as good as they should. They may do well in drought conditions, however when normal seasons resume, the plants will probably die. One way to help this problem is to buy grafted plants, but remember grafting can’t fix unfavorable climate conditions. Western Australia has some of Australia’s most spectacular flowering plants, and horticulturalists are always working in ways of making more available to grow in the populous states. Many popular plants that we see in retail now, were originally in the almost impossible to grow category, but now have been by “sorted” by effective R&D. As always there are exceptions as shown by numerous Acacias, Banksias, Eucalypts, Diploaneas, Conostylis, Anigozanthus, Dryandras, Hakeas, Boronias, Alygoynes, Grevilleas, Eremophilas Chamalauciums etc etc growing in the eastern states.